On October 14, 1997, a bullet tore through Heather Grossman’s neck leaving her paralyzed, breathing on a ventilator, and requiring 24-hour nursing care. After 10 years of living in fear of her first ex-husband, Ron Samuels, at last justice prevailed, as Ron Samuels was found guilty of hiring hit men to kill his ex-wife. What could motivate a person to do such a thing, you might ask? According to Heather Grossman, her ex-husband sought custody of their three children after she remarried in 1997 to John Grossman. Although Mr. Samuels denied the charges, the pressing evidence and testimony from the hit men, who exchanged testimony for their freedom, was enough to sentence him to life in jail. A source of immense strength and inspiration, Heather Grossman is the reigning Ms. Wheelchair Arizona. She also won first-runner up and the Achievement Award in the Ms. Wheelchair America Pageant, where she was the first contestant ever to compete who was fully disabled on life support. Recently, her amazing achievements and cause were recognized by the United States President himself. 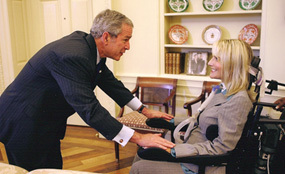 Ms. Grossman was nominated by Senator Jon Kyl, R-Ariz., to meet with President Bush at the Oval Office in Washington, D.C. on November 6, 2007. When one of her nurses was unable to assist her in her trek to the White House, Nouveau Riche CEO Jim Piccolo provided the financial support to enable her parents to attend. She says “never in my life did I ever think I would meet the President of the United States.” During this meeting, she and her family spent 30 minutes in the Oval Office, where Ms. Grossman discussed Heather’s Haven of Hope and her “hope to save lives” as well as areas of funding for victims of crime. According to Ms. Grossman, the President told her how proud he is of her and what she has accomplished in her life, and to keep doing the good work.